There are hundreds of different English riding bits with many subtle variations and strange names. Most are derivatives of a few basic bits that remain popular amongst English horseback riders. Here are six of the most common English riding bits you can use on a horse that is ridden English. When comparing English bits it's helpful to know the different parts of the bit. Learning where and what the rings, cannons, and joints are will help you understand the how specific snaffle and curb bits differ. This pictorial will help you identify the parts of a basic bit. The English Loose Ring Snaffle Bit is probably the most common English riding bit. It's often the bit first introduced to horses, whether they are destined to be ridden English or western. 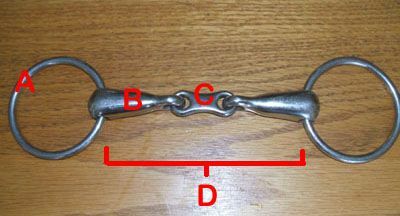 Many horses area ridden in some variation of a loose ring snaffle bit. It is a nice simple bit that is useful whether you ride in your backyard or in the show ring. If you find your horse's lips are being pinched, you can buy inexpensive guards that stretch over the rings. Named for the shape of the rings, this bit is another very common English riding horse bit. Some people prefer these for starting young horses. They are a little quieter in the horse's mouth because the rings are more fixed. Some horses are quite comfortable in them. Others don't carry them well. Because of the way the rings are attached to the mouthpiece, there is less chance of the horse being pinched. This is a bit commonly used for racehorses. An English Eggbutt Snaffle Bit may be the perfect soft bit for some horses, and others may find it an uncomfortable mouthful. This is another popular bit for riding young horses in because it is very mild. Like the D-ring Snaffle, pinching at the corners of the mouth is unlikely because of how the rings are attached. English Full Cheek Snaffle Bit is designed so it does not pull through the horse's mouth. The tops of the cheeks may or may not be affixed to the bridle. Doing so changes the action of the bit somewhat. An English pelham somewhat combines the action of a curb and a snaffle bit. It can be ridden with two sets of reins like a double bridle, or with converters to attach a single set of reins. This bit may not be allowed in some disciplines. In many places, you are more likely to see an Uxeter Kimberwick with slots in the rings, than the kimberwicke with plain D-shaped rings. They are also often seen on ponies, giving their young riders a more 'brakes' than a plain snaffle on a pony who tends to be strong. Although they look different, they are a bit like a pelham in that they combine the action of a snaffle and a curb bit. How Do You Use An English Pelham Bit?